Hydrogenic geosystems are a meaningful link in the natural community of the DNP. 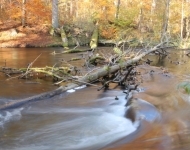 The main rivers of the Drawa National Park are Drawa and its left-bank tributary Płociczna. 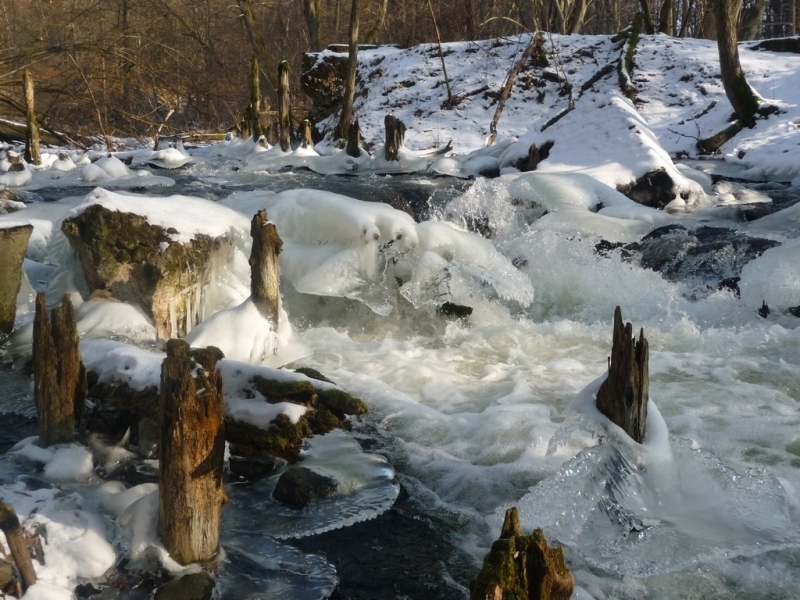 On average, 15 m³ of water runs through Drawa every second, and 3 m³ through Płociczna. In addition to Drawa and Płociczna, the following rivers also run through the DNP area: Słopica, Korytnica, Runica, Cieszynka, Moczel, and Sucha. There are 20 lakes in the Park. 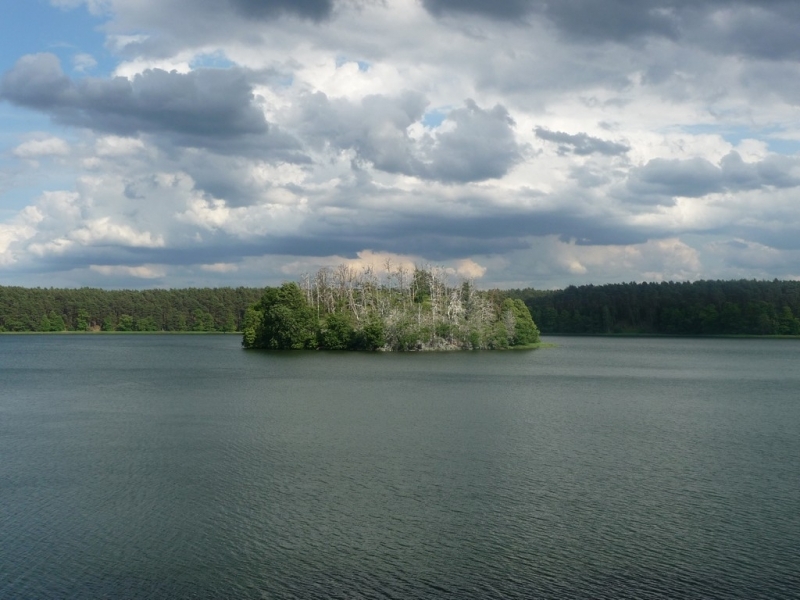 Their ecological characters are significantly varied: from the peat-based distrophic lakes such as Pięć Jeziorek Torfowych also known as (the “hungry lakes”) through eutrophic ones, such as Sitno, Płociczno, and Ostrowiec, to mesotrophic lakes Martew, Płociowe, and Pecnik Duży. 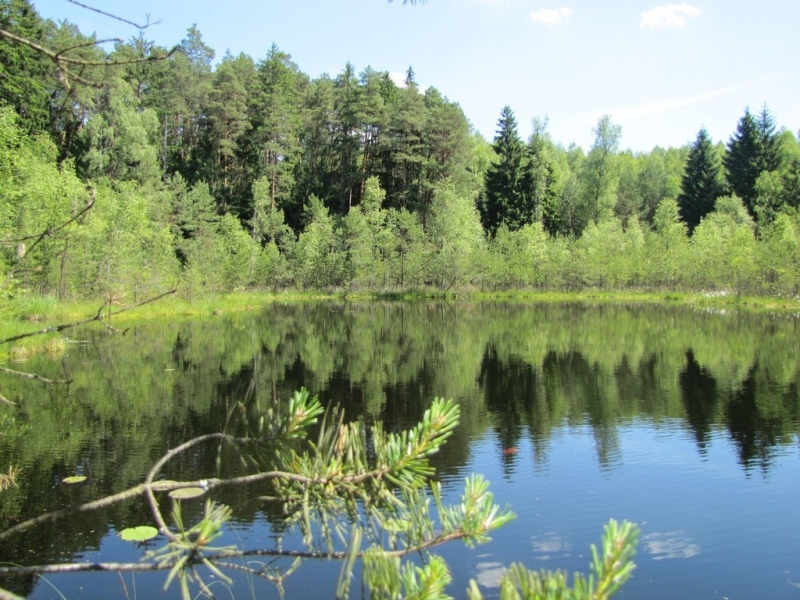 One hydrologic rarity is Czarne – a meromictic lake surrounded by woods. The ecological differentiation of the lakes is visible to a naked eye, as the lakes differ even in their colour. The mesotrophic muskgrass lakes are, especially in the sunny days, have the colour of an intense emerald, and the distrophic ones are dark, almost black. 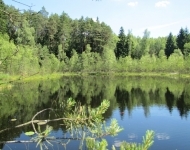 Some of the unique elements of the Drawa Natioinal Park water system are outflows of underground water: brooks, leakages, and exudations, as well as the well-head peatbogs formed by those outflows. 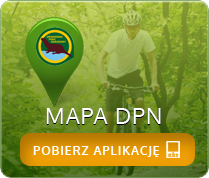 The Drawa National Park stands out for the abundance of different ecosystems. There are 224 documented plant communities. 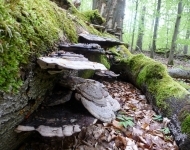 The surface area is dominated by forests (80% of the total park area), mainly beech woods, alder-lined meadows and swamps, and patches of pine woods. Another characteristic element is peatbogs, along with water and meadow ecosystems. Nearly 80 plant communities present in the DNP have been classified in the European Habitat Directory. Among them are the fertile acidic beech woods, dry ground forests, marshlands, fragments of swampy forests and birch woods, the damp and fresh meadows, moorland, the underwater muskgrass meadows in lakes, the pond-weeds of eutrophic lakes, well-head vegetation, concentrations of water crowfoot in river currents, straw rushes, peat morasses, vegetation of the transitional peatbogs, and moss-grown spots. The Park forests are dominated by pine, but there is also lots of beech, oak, and artificially introduced spruce. The rarest here are service-tree and yew. The DNP area is presently overgrown by 924 classified species of vascular plants, of which 55 are strictly protected. The most precious and unique representative of vascular plants is the fen orchid, several of which grow in one of the peatbogs. Another rarity is the northern leatherleaf in the Sicienko peatbog. Very precious are two populations of marsh violets: the creeping violet and the fen violet, as well as a whole group of peatbog plants with the mud sedge, round leaf and long leaf sundew, arrowgrass, Buxbaum sundew, and crested wood fern. From the surrounding areas, the Park is rich in orchids. Three of the peatbogs are home to the marsh helleborine, another – to the mentioned fen orchid. Tragankowe Urwisko by Drawa has a large population of the red helleborine and its relative, the broad-leaf helleborine is common in leafy forests. Meadows are rich in red, broad-leaf, and spotted march orchids, and some lesser butterfly orchids and common twayblades are found in the thicket. Some other interesting species are: sunningdale, grass of Parnassus, stiff, flat and running clubmoss, marsh orchids (mentioned before), southern adder’s tongue, prince’s pine, and a whole group of peatbog species: mud and slender sedge, sundews, wild cranberry, bog rosemary, marsh tea, white-beak sedge, arrowgrass, Turk’s cap lily, European ginger, common honeysuckle, and twinflower. 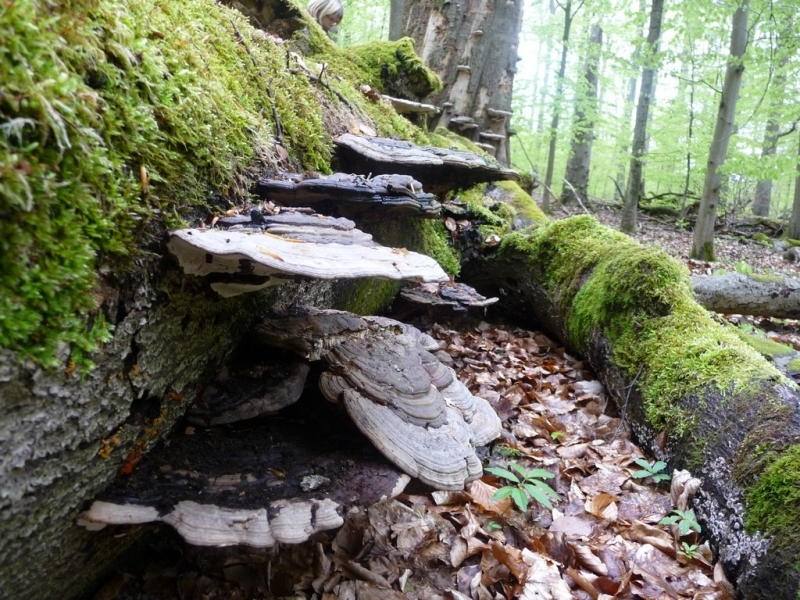 Also interesting is the cryptogamous plant flora and the fungi. Some very rare phylum Bryophytae can be found here, such as: Helodium blandowii, Paludella squarrosa, Sphagnum fuscum, and other rare Sphagnum species. The DNP is one of only two places in Poland where one can find Arthonia aspersella. Some rare fungi appear here also, for example the icicle, porcelain and cauliflower fungus, and the saffron milkcap. The DNP area has a unique fauna not only on the regional or Polish, but also Central-European scale. Those interested in fauna are drawn here by the possibility to see a white-tailed eagle, osprey, cormorant, merganser, grey goose, or a beaver’s feeding ground. The rivers’ ichtyofauna – especially of Płociczna and Drawa – is extremely diverse. 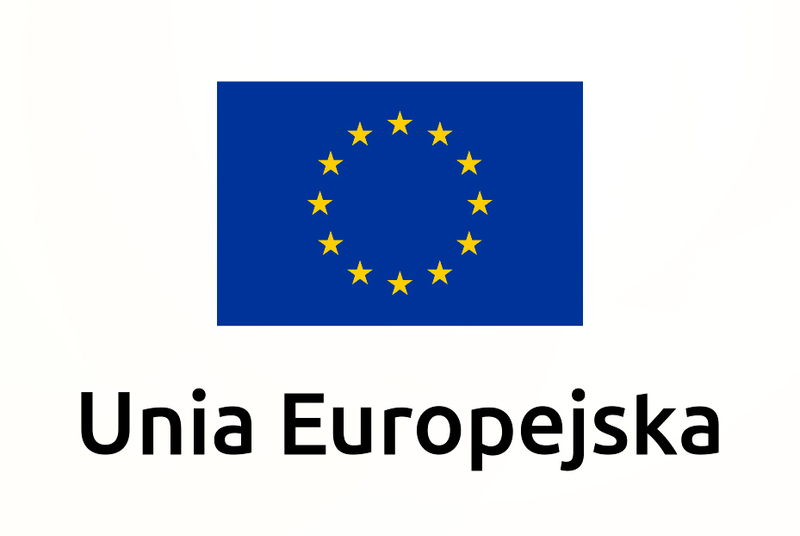 It hasn’t been affected by the same degree of degradation as it was in other Polish rivers. 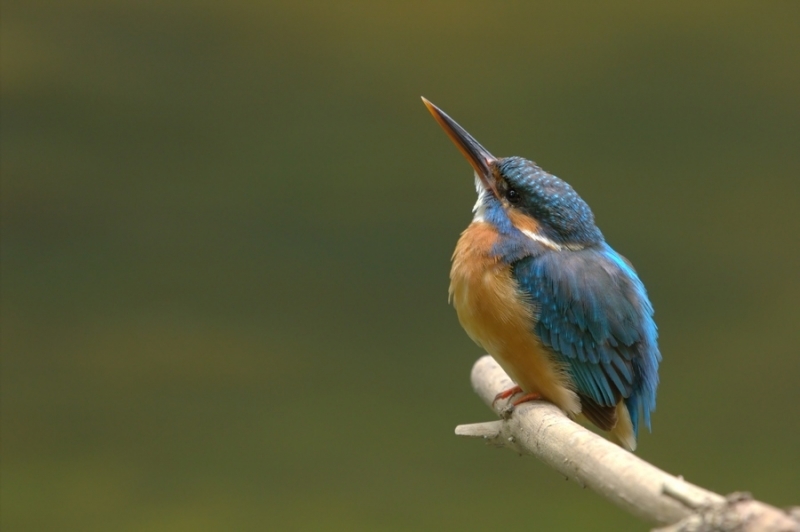 Besides some profoundly endangered species, such as the river and brook lamprey, migrating trout, and Baltic vimba, other still rare on the country’s scale have remained relatively stable and numerous: the brook trout, greyling, Eurasian minnow, and white-finned gudgeon. 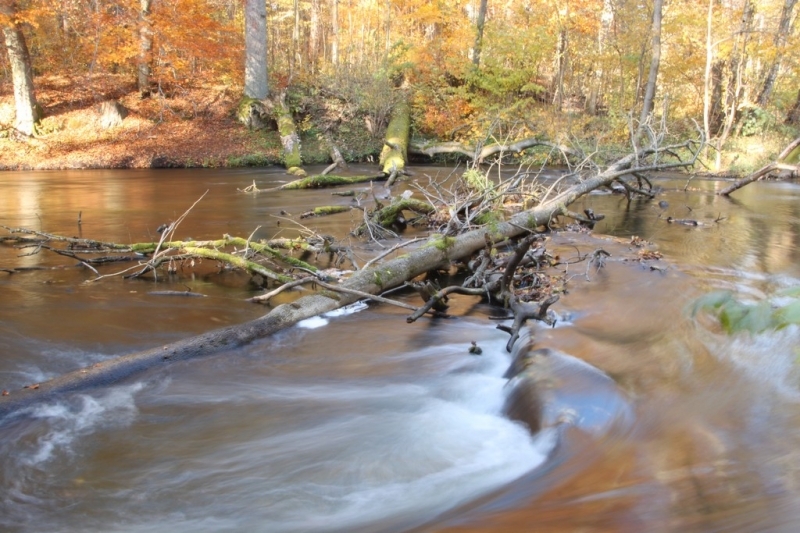 The native salmon population disappeared in the 1980’s, but presently, under the national salmon preservation program, Płociczna and Drawa are being artificially populated with salmon grown in the rivers of Latvia. In the Park’s lakes, as well, some rare fish species remained – the very rare in Poland lake trout, and the disappearing on the country’s scale European whitefish and lavaret. In peatbogs, old fish-ponds and swamps, dried-out ponds, lakes, and mid-forest ponds, in the fields and meadows with swampy areas, we can meet many amphibians. Very common are frogs: the green water frog, swamp frog and grass frog, fire-bellied toad and three other toads, and the Eurasian spade-foot toad. One can also see a tree frog. Among the reptiles, besides the popular lizards (sand, viviparous, and blind-worm) and grass-snake, worthy of mentioning is the zig-zag viper. There also is a small population of the mud turtle. Some spotted smooth-snakes were noticed just outside of the Park borders. In the Park one can see over a half of the bird species present in Poland. The most precious are: black stork, merganser, black kite, red kite, white-tailed eagle, lesser spotted eagle, osprey, hazel grouse, eagle owl, and boreal owl. Other rare or endangered on the regional scale species appearing here, usually common to islands, connected to some disappearing ecosystems, are: cormorant, goldeneye, bumble-bee eater, English hobby, corncrake, , crane, snipe, stockdove, wryneck, green woodpecker, mid-sized woodpecker, mountain wagtail, warbler, firecrest, butcherbird, green finch, oak crossbill, and others. 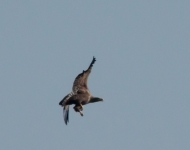 The population of osprey, white-tailed eagle, eagle owl, crane, grey goose, and merganser is much denser in the Drawa Wilderness and Drawa National Park than anywhere else, therefore contact with them is much easier here than elsewhere. Another spectacular element of the Park’s natural habitat is the colony of cormorants on the Lake Ostrowiec’s island. Among mammals, the easiest to see are deer, roe-deer, boar, fox, or hare. The elk population is especially numerous in Autumn and Winter, when they migrate to the Park area in search of peace and quiet. Almost everywhere one can see the signs of beavers’ activity, although it is difficult to see the animal itself. 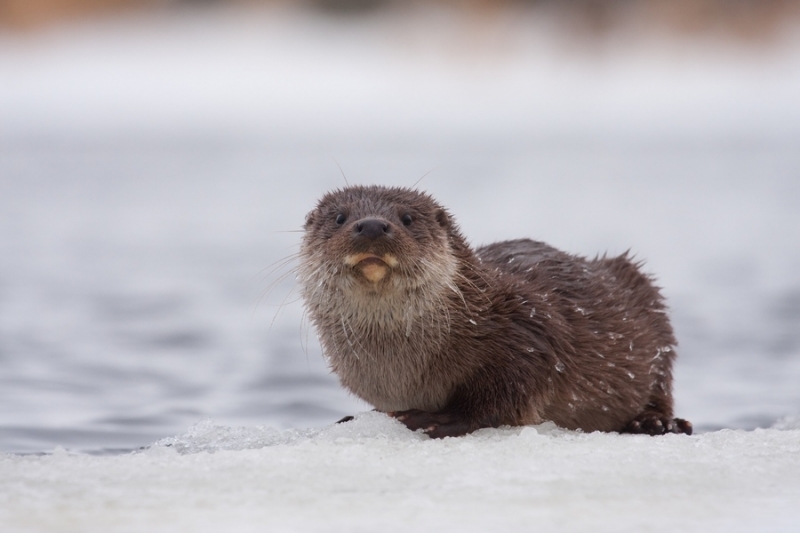 The crest animal of the Park – otter – is common here, though also rarely to be seen. 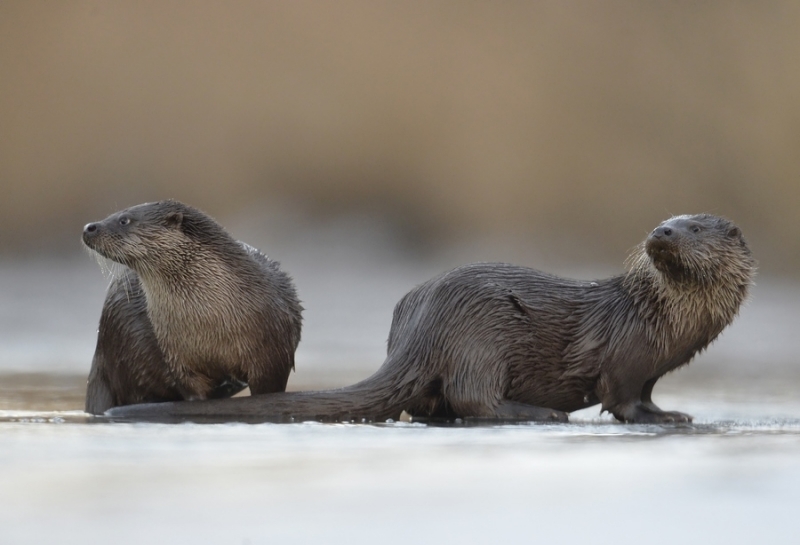 The mammals fauna is also supplemented by shrews, rodents, bats, hedgehogs, and small predators, such as two kinds of marten, fitchew, ermine, and badger. Sporadically an elk, fallow deer, wolf, and even bison that live nearby will enter the DNP area. The world of invertebrates here is very interesting. Among the initially inspected molluscs, leeches, caddis-flies, dragon flies, and butterflies, there are many rare or even unique species.